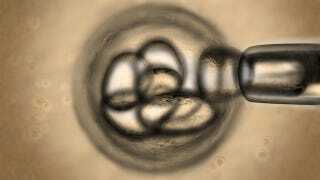 In a step forward in stem cell research, scientists have created the cells by combining a human egg with skin-cell DNA. However, this doesn't eliminate the need for more controversial embryonic stem cell research. According to CNN, researchers artificially created embryonic stem cells by introducing skin-cell DNA into an egg cell without removing the egg's own genome. They determined that the egg DNA needed to remain in order for the egg to develop into stem cells. However, the resulting cells have 69 chromosomes instead of the normal 46, so if you put them in a human body, that person becomes Spiderman. Scientists will need to find a way remove the egg's chromosomes to eliminate the excess before the cells could be used to treat diseases like Parkinson's and diabetes. This isn't the first time scientists have artificially created stem cells — in 2007 they made "induced pluripotent stem cells" by stuffing skin cells full of viruses. These had the right number of chromosomes, but suffered from other problems. Obviously lab-made stem cells are less politically problematic than those derived from actual human embryos, and maybe one day the artificial ones could replace the natural. However, scientists say right now they need all options open in their efforts to cure disease. So the Spidey cells aren't going to end the stem-cell debate, but they might be a step in the right direction.